➤ Early 1900s: Nello and Gino Pellegrini arrived in New York City from their native Tuscany, working their way across the United States to the California coast. 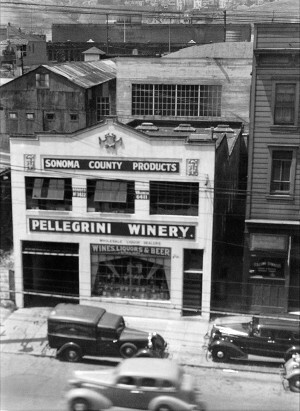 ➤ 1925: Pellegrini became Sonoma County grape merchants, shipping grapes throughout the U.S. for home winemaking. ➤ 1933: Upon the repeal of Prohibition, the brothers were issued Winegrower License #4 and established their first bonded winery. ➤ 1950: Nello’s son Vincent took over direction of the winery in the early 1950s, and expanded into wholesale distribution of imported and domestic wines and spirits. ➤ 1973: Vincent and his wife Aida purchased a 70-acre apple and plum orchard and eventually planted Chardonnay and Pinot Noir grapes. Olivet Lane Chardonnay, and the name took off. The vineyard became the grape source for many of the finest Russian River Valley Pinot Noir wines. ➤ 2001: The Pellegrini family built a state-of-the-art tuscan style winery upon their Olivet Lane Vineyard, which is today home to our central office and hospitality & visitor center. ➤ 2017: Alexia Pellegrini (4th Generation) takes the helm of the family business, running winery and vineyard operations.